UV-tracking wearables, which tell you when you've been out in the sun too long, have grown in popularity over the past couple of years. L'Oréal has the My Skin Track UV, and there's also LogicInk's UV-sensing tattoo. Now Adam & Aoki has a new take: a shirt that can tell you when you've had enough sun. The shirt, available on IndieGoGo now for €38, uses nanotech to detect UV rays from the sunburn action spectrum, which is a measure of skin sensitivity. The shirts have fabric that goes from white to pink to bright red, which is when you know it's time to get some shade. The shirt is intended for kids, and comes in a couple of designs. Flamingo Flair has a big old flamingo on the front of it; Caspian Tiger has a sketch of a Caspian tiger, the now-extinct tiger breed; Edinburgh Classic has a zig-zag design; and The Original comes in either white or black with dots of colour. Nik Penhale Smith, co-founder and CEO of Adam & Aoki, said the company wants to create a simple way to help people avoid sunburns and, by extension, skin cancer, as sunburn can increase your chance of getting skin cancer. "It doesn't have to be super complex, especially for children. Red is bad, and it's time to take preventative action and go find mum and dad," he says. He points out that parents have enough to worry about, and that getting kids to put on sunscreen or even putting UV-sensing tattoos on them can be difficult or frustrating. Unlike UV-sensing tattoos, Adam & Aoki's shirts are designed to be worn multiple times, according to Seamus Kelleher, co-founder and COO. "It's designed to have the longevity of just a normal t-shirt. Obviously we've still got a few bits of testing still to do but from our perspective in the lifetime of the t-shirt it'll work consistently every time." Using the Fitzpatrick skin scale, the shirt is offered for three different skin types. When you go buy the shirt, you'll have to choose the one that's best for you. Sensitive is for people with skin that burns easily, Less Sensitive is for people who sometimes burn and sometimes tan, and Not Sensitive is for people who rarely, if ever, burn. Kelleher says Adam & Aoki are thinking beyond the kids' t-shirts. It sees opportunities in creating UV-sensing shirts for outdoor sports, swimwear, and even people who work outdoors. 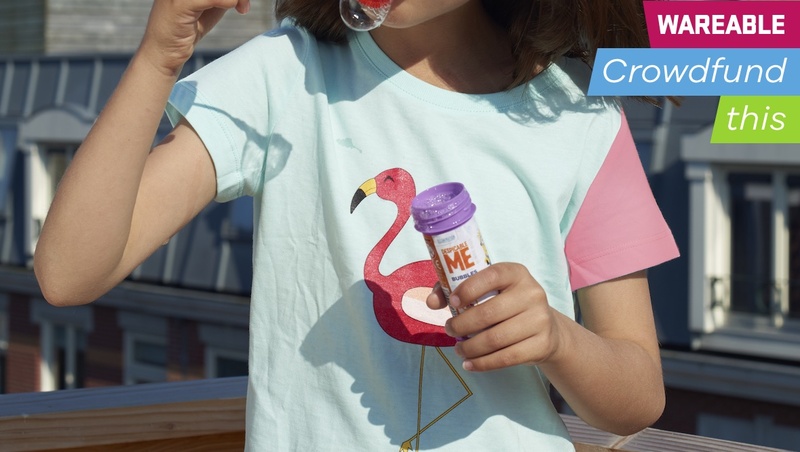 The company does want to make sure the kids' t-shirts are all sorted and out the door first, but it wants to move fast into other types of clothes as it believes it can help people avoid sunburns, especially as climate change brings warmer weather. This isn't just a line Adam & Aoki is using to bolster their brand. Both Penhale Smith and Kelleher have lost loved ones to cancer. Penhale Smith, specifically, counts his mentor dying from cancer when he was 14 as something that helped drive him to develop the smart t-shirts in the first place. We're not going to need a colour-changing shirt to answer this question. Adam & Aoki do seem to have a noble goal: they want to help people be more aware of when they're getting sunburnt, which can do a lot to help people minimise their risk of getting skin cancer. Skin cancer is one of the most common forms of cancer in the US, with over 5.4 million new cases a year. Anything that can be done to minimise its threat is good, and Kelleher and Penhale Smith have some personal experience here. Plus, this shirt is aimed at kids, so you're reducing your child's risk of getting skin cancer later in life. The bigger question is whether Adam & Aoki can actually deliver the amount of shirts it wants to. Penhale Smith says the company is confident that it can deliver what it says it can, but it also recognises that it would be foolish to think that everything was 100% certain. Rather than have backers buy into getting a shirt, Penhale Smith says he wants backers to buy into its "movement", which is to reduce skin cancer rates and help people. Still, Penhale Smith says that Adam & Aoki is working with some of the best people in the fields. "We're not a gimmicky, amateurish, cowboy-ish startup just hoping for the best," he says. "We really are working with people who know what they're doing."